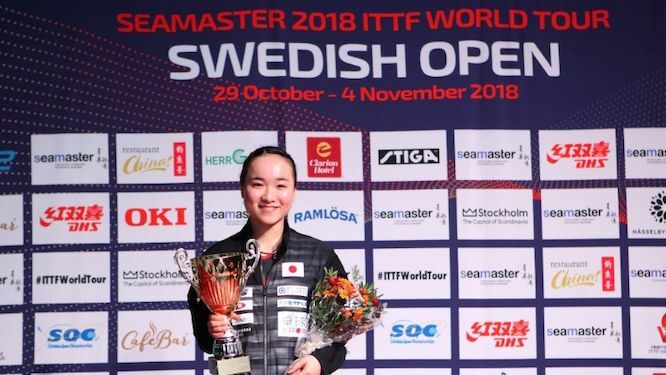 The Seamaster 2018 ITTF World Tour Swedish Open concluded in some style for those to claim gold on Sunday in Stockholm. Having pulled off a number of comeback wins earlier in the weekend, Mima Ito took her final match by storm, seeing off Women's World no. 1, Zhu Yuling, with an emphatic 4-0 scoreline (11-3, 11-3, 11-5, 11-8) to claim her sixth career ITTF World Tour title. The result capped off an extraordinary tournament for the Japanese star, who had overcome in breathtaking fashion two other heavyweights of the Chinese Women's game: World no. 6, Liu Shiwen, in the quarter-finals (12-10, 7-11, 7-11, 5-11, 13-11, 11-4, 11-8) and World no. 2, Ding Ning, in the last four (3-11, 7-11, 12-10, 11-6, 11-9, 11-8). Now ranked seventh in the world and sitting fourth in the World Tour standings, Mima Ito underlined yet again the threat she poses to China's elite. After all, the 18-year-old arrived in Stockholm already boasting a glistening track record against top Chinese opposition, having beaten Liu Shiwen at the World Team Championships in Halmstad in May and seen off Chen Xingtong and Wang Manyu en route to Japan Open glory in June. Needless to say, if she can keep up such impressive form, Mima Ito will be flying her country's flag as a serious contender for the ultimate prize at Tokyo 2020. Coming off the back of last month's World Cup victory in Disneyland Paris, Fan Zhendong showed again on Sunday just why he is the Men's World no. 1 by beating compatriot and no. 2 seed, Xu Xin, 4-1 in the final (11-7, 14-12, 13-11, 9-11, 11-9). In doing so, Fan Zhendong reversed last year's result between the same two finalists. Since that defeat, the 21-year-old has lost just once in Singles events on the international stage: against Ma Long at the Seamaster 2018 ITTF World Tour China Open in Shenzen. In the Women's Doubles, Sun Yingsha celebrated her 18th birthday in style, partnering Chen Xingtong to a 3-1 victory over unseeded duo, Liu Gaoyang and Zhang Rui (11-5, 9-11, 11-7, 11-6) for their third ITTF World Tour title of the year. Meanwhile in the Men's Doubles, Sweden's Mattias Falck and Kristian Karlsson were beaten 2-3 by Chinese Taipei's Liao Cheng-Ting and Lin Yun-Ju (10-12, 11-8, 11-8, 6-11, 13-11) to deny the home nation of final day glory. The race to qualify for the Seamaster 2018 ITTF World Tour Grand Finals in Incheon, Korea, will conclude with the Seamaster 2018 ITTF World Tour Platinum Liebherr Austrian Open in Linz, held between 8-11 November (qualifying between 6-7 November).